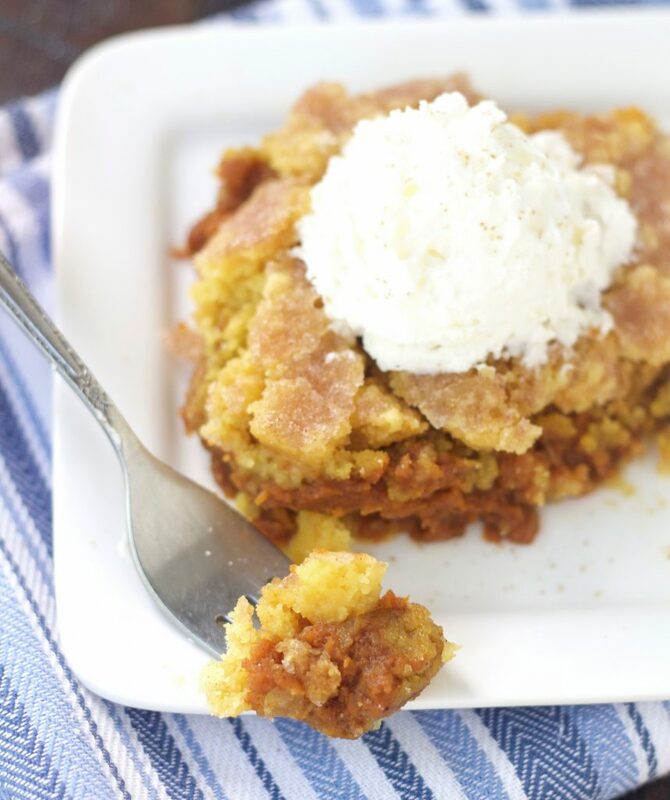 This Slow Cooker Pumpkin Dump Cake recipe is a simple, absolutely delicious easy dessert. Just dump everything in and let your slow cooker do all the work. Your house will smell amazing while it’s cooking! Ok, I’ve held off as long as I can posting a pumpkin recipe. I know it’s not officially fall quite yet, but it is September now, so I think it’s ok to start pulling out those pumpkin and apple recipes. Don’t you agree? 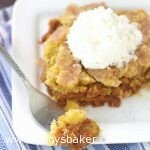 I made this Slow Cooker Pumpkin Dump Cake several weeks ago and have been dying to share it with you. I love all things pumpkin. Just search “pumpkin” on my site and you’ll see what I mean. I don’t know if I could pick my favorite one (that’s like asking me to pick a favorite child), but a couple of my top picks would definitely be the pumpkin chocolate chip streusel cake (I LITERALLY could eat the entire pan!) 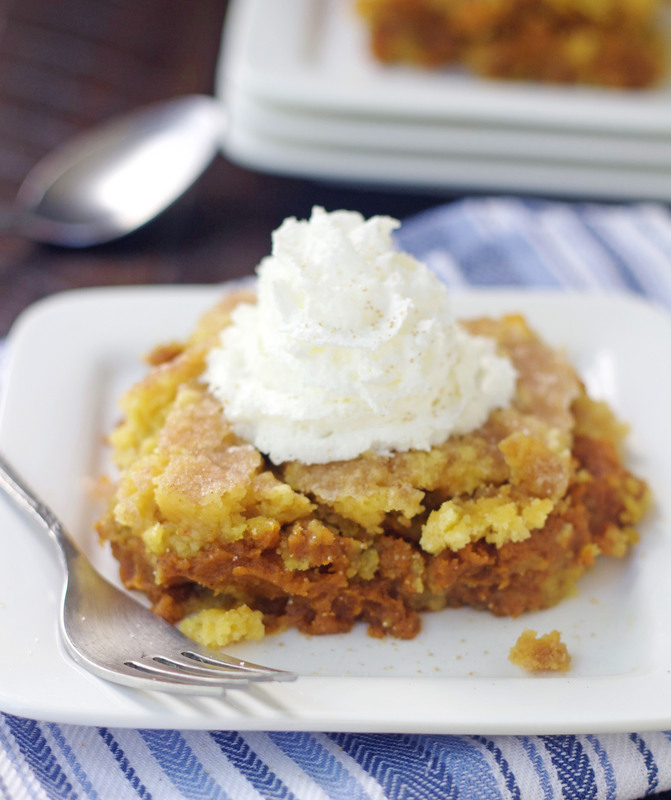 and the pumpkin cheesecake streusel bars. 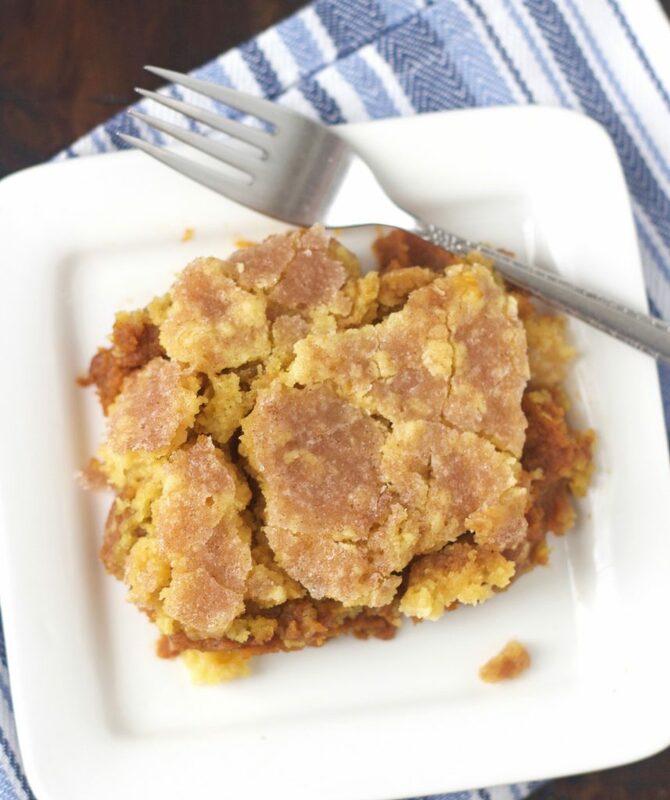 I happen to love dump cakes too, so this Slow Cooker Pumpkin Dump Cake won me over instantly. You guys, it’s so good. Now in my opinion, it really is more like eating pumpkin pie with a delicious buttery, crispy topping. Just look at that buttery, crispy, sugary topping. . . it’s soooo good! Like any dump cake, this is so simple to make. You basically mix and dump. I’m going to be pretty blunt here, so please forgive me. Living in a house of all boys, the word dump is usually associated with the bathroom, so it doesn’t usually have the greatest connotation (do you understand what I’m trying to say?). But when it comes to desserts, I’m totally ok with the word dump. You really, really need to make this. You won’t regret it. In a medium bowl, combine the sugar, pumpkin puree, pumpkin pie spice, cinnamon, vanilla and salt. Mix well and spread on the bottom of a greased slow cooker (I used my 6-quart oval shaped one). In a separate bowl, combine the cake mix and the butter. Use a fork or a pastry blender to cut the butter into the cake mix until butter is pea sized and cake mix is crumbly. Sprinkle the cake mix on top of the pumpkin puree. In a small bowl, mix the 1/4 cup sugar and 1/2 teaspoon cinnamon. Sprinkle over cake mix layer. Place a layer of paper towels or a thin dish cloth on top of your slow cooker. Place the lid over the paper towel and make sure it is secure. (This prevents condensation from dripping onto the cake so the top part crisps up) Cover and cook on LOW for 3-4 hours or on HIGH for 90 minutes-2 hours. Remove the lid and turn to warm. Let sit on warm for 20-30 minutes and then top with vanilla ice cream or whipping cream. This is so yummy! I am not going to lie……I ate it for breakfast! Dump cakes are so good, and I can imagine how wonderful your house smelled while this cake cooked. Hi Elaine, sorry for the confusion. “White” sugar was a typo (oops! ), it’s just granulated sugar. Thanks for catching that. Let me know if you have a chance to make this, I’d love to hear back from you. Can you bake this in the oven any faster ? I’ve never made this in the oven, but I’m sure you could. I would use a 9×13 pan and bake it at 350. I’d set your timer for 40 minutes and then just keep checking from then on. It might only need 45 minutes, but it could take up to an hour possibly. Let me know if you try it. I cooked it at 375 for an hour in an oval dish- about the size of a crockpot. Turned out great! Yay! So happy to hear it turned out. Thanks for letting me know. I hope you enjoyed it. My slow cooker is a 7 quart. Is that a good size or do I need to adjust the recipe accordingly? Hi Toni, my slow cooker is a 6 quart so I think you’ll be just fine using a 7 quart and shouldn’t have to make any adjustments. I hope you love this.